This week I have been mostly playing Super Dungeon Explore! The rulebook is baffling, but having played through it a few times, it all makes a kind of sense. Kind of. But the biggest selling point of this game is how the characters level up using coloured dice. Of course, if you get your hands on a Green Die for your attacks early on, you just butcher everything. So far the heroes have gained the best Loot and Treasure cards each game while the monsters have gained mediocre cards. God help the heroes if the monsters ever ended up with Loot that gave them a Green Die for their Armour or Attacks! It's going to happen eventually though. Perhaps the dungeon master will have the decency to discard that one? It is meant to be a fun game where the part of heroes win after all! Apart from the Sorceress, all the characters are pretty awesome and very straightforward to use despite their plethora of abilities. The Dwarf is just a monster killing machine thanks to 'Cleave'. The Barbarian is another monster killing machine. The Elf Archer is alright for mopping up. The Amber Mage is pretty good for clearing out corridors. The Demonkin Rogue is great for grabbing treasure chests. As for the Druid, his use isn't so clear apart from when he turns into the Angry Bear and unleashes all kinds of mayhem. Only problem with Angry Bear is the base size, which makes him easy for the monster to target, so he does take a serious beating. The Sorceress is good for the Dragon, but so far the heroes haven't had any trouble simply carving through everything in their path! I always take the Paladin, the Dwarf, the Barbarian, the Rogue and the Mage to embark on a quest of pure destruction. I've got 4 fighters and 1 shooter. The Dwarf butchers anything tightly packed together while the Barbarian runs around and carves up any enemies which are well spaced out. 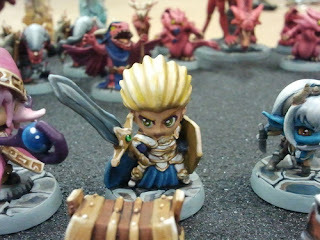 Meanwhile the Paladin cleans up and heals, the Rogue cleans up and grabs treasure or takes down anything on 2 Wounds. Finally, the Mage carries 2 potions for extra healing and provides some much needed long ranged support for any more clustered enemies. Personally, I found the Angry Bear to be too much of a liability due to his size. And the Sorceress can't do much until the monsters have levelled up or the Dragon has appeared. So why bother having her when you need to keep killing to keep drawing Loot cards? On a related note, my Super Dungeon Explore Battlefoam trays came in the post. But there's just 1 problem. While all the models fit in, the board sections do not fit inside the box along with all the foam trays! 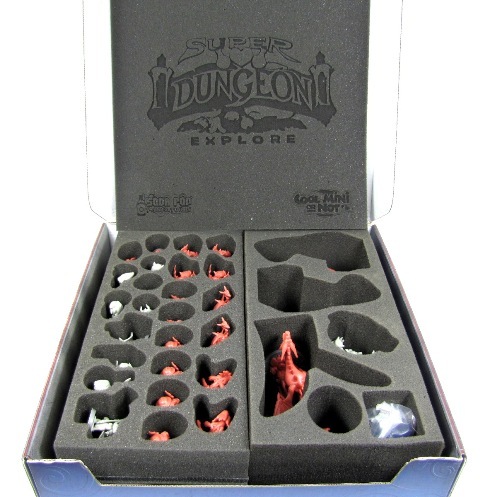 So now I need a sturdy cardboard box of some kind to keep the Super Dungeon Explore box in and the board sections on top of it too. Not impressed. 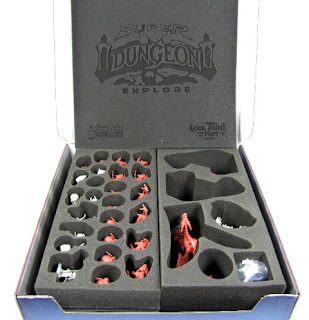 Either way, I'm looking forward to playing more games of Super Dungeon Explore and eagerly await the first expansion set. Hopefully they will include an updated version of the rulebook with it as well. So, level with me man; this game looks like a lot of fun, but is it really $90 plus S&H fun? The revised edition costs even more now, leading me to seriously question whether the game is good value or not. I think the idea of the game is good, but the level of detail and complexity is just that little bit too deep. I end up playing the Dungeon Master all the time because I'm the only one who understands how the game works and what's actually going on. The pure pick-up-and-play element of this game could be a lot better.